As many of you (hopefully!) 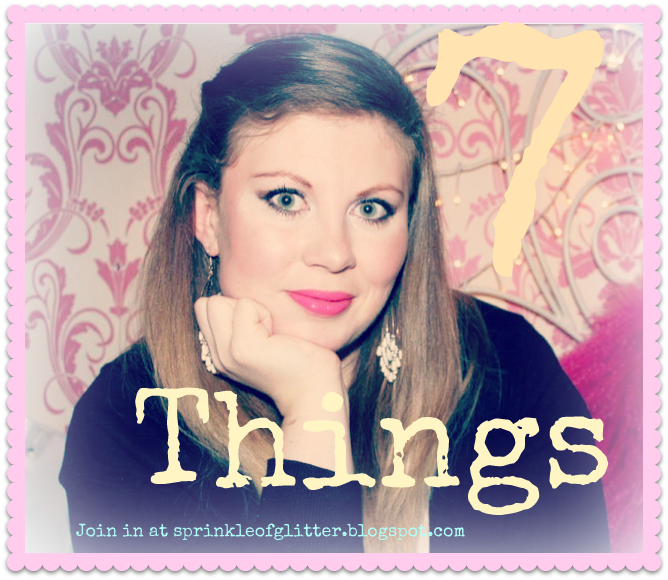 have been enjoying Louise's '7 Things For 7 Days' series, she has asked anyone and everyone to get involved and join in. All you have to do is set REALISTIC weekly goals to get motivated to achieve (writing lists is one of my motivational ways- I'm a big list writer) things you want to achieve. 1. Exercise- Now I think this shall be on everyones list in some shape or form. I went for a run yesterday morning and my knees are killing me. I wish there was a swimming pool or gym with in walking distance as I have not passed my test yet. Running at least three times a week will have to do. 3. Cook- Not an eight course meal, just something nice for the family. 4. Make a decision- I am an awful decision maker. Terrible. Horrific. I sit there in a restaurant saying 'Gammon or a burger, gammon or a burger'... So my big decision will be what I want to apply for in Uni and tell my mother! 6. Less snacking on the bad stuff- Let's face it, it's not 'bad', it's bloody yummy. Crispy and chocolate and sweets just seem to fill me up more than a banana or an apple. But more snacking on the bad stuff equals fat fat fat, so lets see if I can keep it to one a day for a week! 7. Don't blog about unexciting things- Who's going to want to look at and read my blog if its a load of crap? I need to keep in with the trends and up to date in the blogging work. No slacking! I hope you all will have a go, it's great fun and I could honestly think of seven more! Have fun! I follow Sprinkle of Glitter and one of the things that should be on my list every day is " when you see something really good to do, write it down so you dont forget ! " Seeing your blog with Louise's face reminded me to start a seven things to do list. Haha, thank you so much. I agree with you completley! Thank you for your kind words, I work hard on my blog! I think in this community, we're all like that! I can't wait to pack! I am decision disabled too. That made me lol haha. I've seen a few other posts like this, I think you have good goals. Good luck! Thanks for the luck, it's going well so far! Ohhhh, number four is a big one!!! I am not good at making decisions either, always afraid to miss out on the other good stuff. I am looking forward on what you will decide on. I love this. Very inspirational! You should give it a go Keyta, it's great! I'm following you now! Please follow me Juliette!